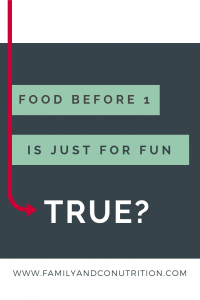 Yes, of course, eating should always be fun and pleasant. 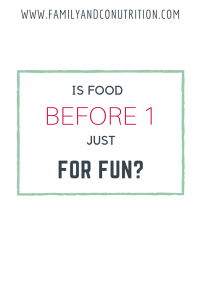 Before one, baby is learning to eat: it should be fun… but it’s more than just for fun! Why do we progress from milk to solid foods? 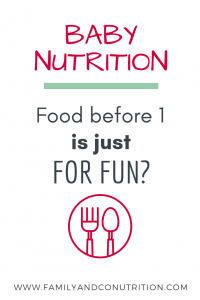 Although milk (breastmilk or formula) will continue to provide most of the calories and nutrients that baby needs in the first year, it is important to introduce solid food around 6 months of age because baby probably shows interest, and is developmentally ready to get eating. Baby is able to hold his/her head, sit upright with minimal help, and to turn the head side to side? 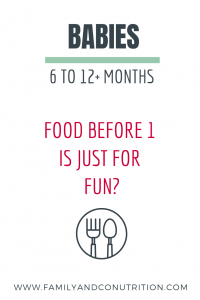 Choose the feeding method that works for your family: traditional feeding or baby-led weaning or an hybrid of both and embark on the solid food adventure! 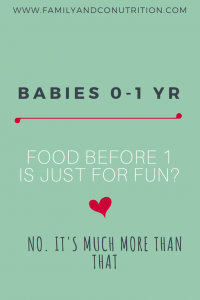 You don’t HAVE to do baby-led weaning, and you don’t HAVE to go the traditional route. There are advantages and disadvantages to both methods. You might have heard good and bad things from both methods. What is most important is that the method you choose feels right for you, baby and the whole family. A non-stressed parent is always key in establishing a positive feeding environment and that is more important than the method you choose. Milk will continue to have an important place in your baby’s diet, but solid foods are offering multiple advantages beyond nutrition! When you’ve observed that baby is developmentally ready to start solid food, offer iron-rich food at least 2 times a day. The iron store that baby built during pregnancy lasts for about 6 months. On top of that, breast milk and formula milk do not provide sufficient iron to meet baby’s needs. So when baby turns 6 months old, offering iron-rich food are important! Iron rich foods should be the first food introduced to baby around 6 months of age. Food is a good “excuse” to get baby practice some moves! 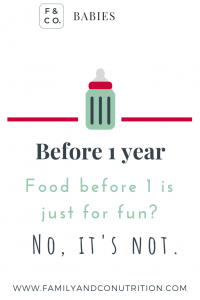 It is not gonna happen overnight, but eating requires a lot of actions and developmental milestones that baby will need to learn such as holding utensils, drinking from an open cup, grabbing food items with the appropriate force, bringing food to the mouth, closing the lips and forming a food bolus, etc. Baby is literally learning to eat. It takes time and practice! 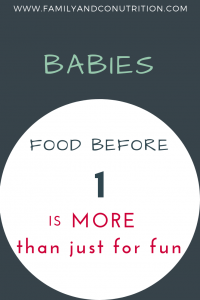 So give baby plenty of occasions to explore, play, experiment with the food and eat. With time, baby will also lose his/her gagging reflex. But because the choking risk will always remain with food or toys, make sure to familiarize yourself with the differences between gagging and choking, and what to do in both situations. Subscribe to access this handy cheat sheet contrasting choking and gagging. Baby has always learn to respect his/her appetite when drinking milk, but now it is different! Baby need to learn to respect his appetite in a context of food abundance. New intriguing foods, different colour, textures, flavours… all very tempting! It is a set of different challenges that present themselves and parents need to guide baby to respect his/her cues of hunger and fullness. More delicious food to eat, and baby needs to learn to honour his/her signs of hunger and fullness. Food also offer the advantage of coming in all sorts of shapes, textures, mouth feels… and it tastes many different flavours! Although baby has been tasting flavours since the womb, the learning continues! 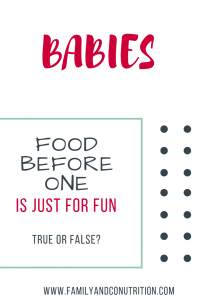 Baby is likely to express preferences over certain foods, but it is important to keep offering foods that were once disliked in addition to serving novel food. Parents offer without pressure, and baby decide to eat (or not). It is suggested to offer allergens as early as 6 months old. Delaying the introduction doesn’t present any benefit. So unless your doctor or registered dietitian has indicated otherwise, it is important to introduce the allergens early in life to prevent allergies. Refresh yourself on the signs of an allergic reactions and how to introduce them without posing choking hazard. Introducing allergens early in life might help prevent allergies. It is important to not just sit and feed your child, but rather all come together as a family (even if it is just once a day!) and eat together. 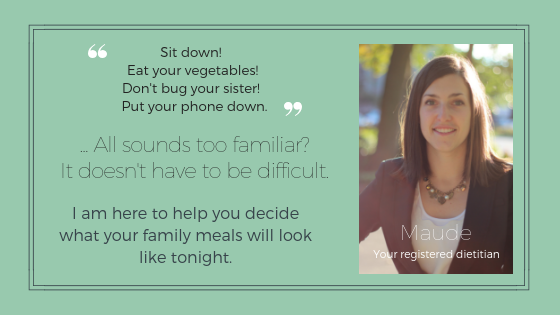 Eating together at the table is one way your child learns what behaviour is expected during meal time. And beyond baby learning all this, parents are also finding their way! You are establishing the new family dynamic with one (more) kid around the table. You might have to discuss with your partner and caregivers/family members the key rules you want to “enforce” in your house. 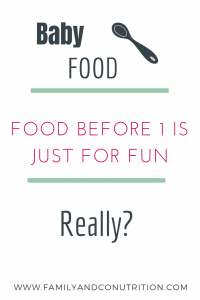 And because part of it should be true, food before one is just for fun, drop some food rules for the whole family and make sure to enjoy! 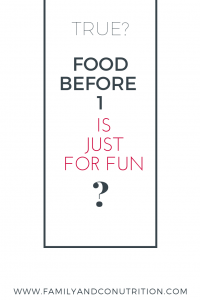 Food is fun! 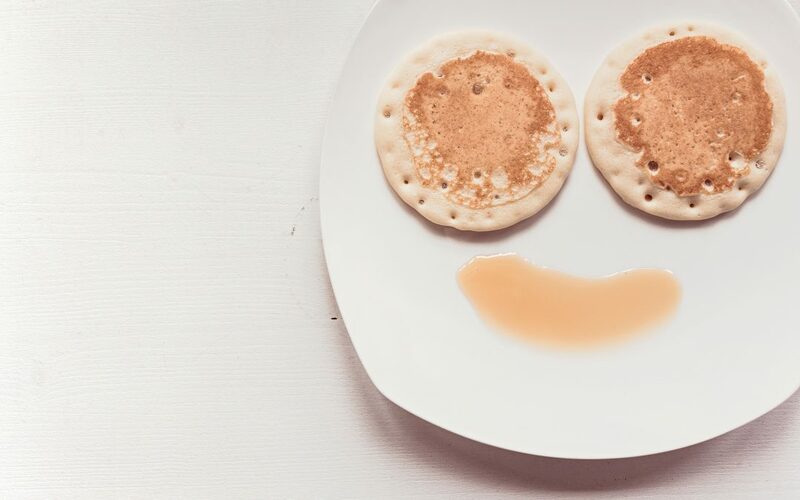 Eating is fun! Not just for baby. 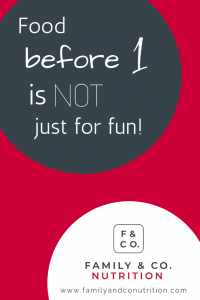 Not just before 1!